China Cola-my first foray into weird, obscure cola-dom. I remember that fateful day three years ago when I was with the whole fam-damily at the local Food Co-op store getting some groceries when the wife decided that we should eat lunch from their deli. I agreed, and although I don't remember what food I ate(probably a bean salad of some kind...), I do remember what beverage I grabbed. I went to their refrigerated display case and perused the shelves, looking for something that would grab my interest. They had a few "natural" soda mainstays-Blue Sky and Hansens of all varieties in individual cans(ugh). They had a few bottles of Izze -avoided that because I wasn't(and still remain) a big fan of carbonated juice drinks, and something interesting looking called Kombucha Wonder Drink . But alas, my palate craved something semi-familiar. 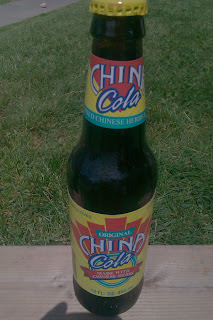 I wanted a cola, and China Cola was sitting there in all of it's bright yellow glory, screaming at me to give it a shot. So, I grabbed the bottle, and proceeded to pop it open. There was a moderate amount of fizz, but nothing too great. Reminded me of all those endless amounts of Faygo over the years-a decent bit of carbonation in the first drink or two, and then quickly diminishing returns every drink thereafter. My initial impression was that of sweet worcestershire sauce, but after I got over the bitter herbal aroma the rest of it went down relatively fine. However, I felt that I hadn't given China Cola a fair go-I was still smoking regular cigarettes at the time, and I discovered that my taste buds had deceived about a lot of foods and drinks. Another factor was that in between then and now I have significantly cut back on my addition of salt to foods, which helped me better appreciate subtle flavor notes I had often drowned out with the delicious ground rocks I had been putting on my food for so many years. Boy howdy, I was glad I decided to give it another go. Upon getting my bottle, I cracked it open, and that same familiar herb and roots aroma wafted into my nostrils, and I prepared myself for the potential horror that lay within. I brought it to my lips, poured it onto my tongue, and surprisingly, detected none of that hard-to-pronounce grog made with dissolved sardines that I was expecting. It was rich, slightly bitter, and had a bit of tang to it. There was a bit of sweetness and the underlying burn of acid, and I was quickly reminded of something I had sampled not too long ago-Pepsi Natural. For those of you who missed it's relatively short run, Pepsi Natural was a gimmicky attempt by Pepsi to break into the naturally-flavored, cane sugar sweetened glass bottle world. It wasn't bad, mind you, but it wasn't what one would expect from a major soda brand. It was flavored with kola nut(most colas use a combination of vanilla and cinnamon as their "cola" flavor), and it came in an interesting bottle with a clear label, a bleached-out(remember, white is a "healthy" color in corporate food packaging) Pepsi logo, and was an almost unappetizing pale brown color. It greatly resembled carbonated tea in a bottle. Anyways, back to China Cola. It was good, and they decided to package it in a dark amber bottle, much like beer, which made it look more appetizing, not seeing the dirty-dishwater tannish brown of brewed tea. It was everything that Pepsi Natural wanted to be(and more), and it most definitely predated by a number of years. This leads me to believe that either Pepsi-Co optioned the recipe for it's marketing campaign, or that a Pepsi-Co executive had tried China Cola and decided he needed to share it with the world, all the while lining his pockets with the profits of his plagiarism. I shouldn't really complain though, because it's entirely possible that if Pepsi Natural had completely tanked we may not have seen the "Throwback" line of sodas hit the shelves. That would have made me a sad panda indeed-you haven't had Mountain Dew until you've had Mountain Dew Throwback. So, in short-you should find yourself a bottle of China Cola. Gaudy packaging and all, it's an interesting soda experience. I wouldn't drink it all of the time, but it's worth tasting a relatively obscure cola that may have inspired the big guys to try their own trumped up version-and how often do you see Pepsi or Coke ripoff a "generic" brand instead of the other way around? Usually they just buy the company and fold it into their own. Side-note. I just did a bit of research and found out that China Cola is distributed by Reed's(makers of a fine ginger ale, and distributor of Virgil's heavenly brews). However, it is only the American labeling of a product called "Future Cola"-which is based in China and has the third largest market share of sodas in the world. Not really fair to call it a "generic" brand, I suppose, but it's still of note that Pepsi copied one of their competitors so blatantly. It's like the modern day equivalent of the "New Coke" fiasco of the eighties, but Pepsi kept their original formula available the whole time. Goddamn if it isn't gaudy as all hell. That's what I like about it though. Catches the eye. It looks like someone designed a logo specifically for a t-shirt, slapped it on a bright yellow field and called it a day. The source of the brew in the bottle looks like a Chinese knock-off Coke can, but Reed's went all out to make sure that didn't happen here in the States by making it look like it was designed by a fourth grader from the early nineties. It doesn't smell like it would taste that good-exactly like a medicinal tea. I blame the peony root and kola nut. Naturally caffeinated by the kola nut, but naturally a little bitter for the same reason. It's not sicky sweet, there isn't as much of a bite to it as one would expect from a cola, and it has a complex blend of bitter and aromatic that dances on the tongue. As stated above, I couldn't drink this bottle after bottle, but it would go quite nicely with a tomato-based dish. Try it out. It might not be for everyone, but I quite enjoy the change of pace every now and then. I think it would probably be good to drink flat for an upset stomach, too. Thanks for the review. I was curious how this tasted. I generally don’t like colas; sometimes one will hit the spot though. I absolutely love the cola. I could drink it every day. It’s crisp, not too sweet, and very refreshing. If you ever read this, I would recommend the China Cherry Cola. I prefer it to the regular (which I do also like). I have found with the China cola products they are better poured into a glass. I think there is something they use to seal the caps that can linger on the lip and cause the soda to taste metallic.